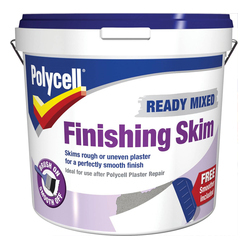 Gives a smooth finish to slightly rough or uneven plaster. Simply brush it on and smooth off. Skims up to 3mm thick with strong adhesion. ToolsDamp cloth, brush and filling blade. Spread on with a paint brush using upward strokes. Smooth over using the free spreader moving in an upward curve. Maintain a firm, even pressure. Don’t worry about small irregularities or ‘tramlines’. Allow to dry for 2 to 3 hours until the surface appears matt. Now use the spreader to achieve a flat, smooth finish, rewetting the surface if necessary. After 3 to 4 hours you can re-wet the surface and rub gently with a damp cloth and use the spreader to remove and finish irregularities for a super-smooth finish. Allow to dry for 24 hours. Prime before painting, size before papering.